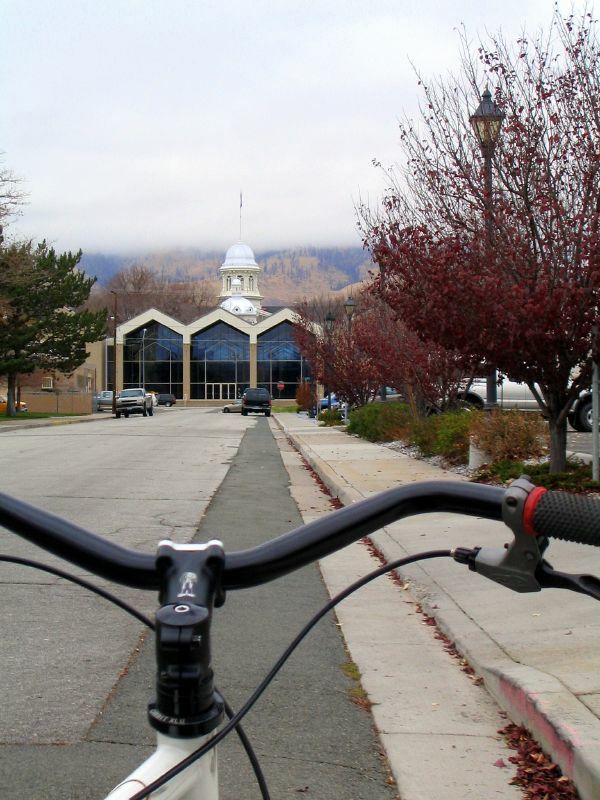 One of the top reasons for moving back to Carson City was to be able to commute to work by bicycle. My previous commute was a 32 mile round trip, but usually became closer to 50 miles when I added other errands or lunch time rides. It was adventurous and fun, but certainly not practical to do everyday. I only did it three times during bike to work week, and gave up. Today was the first bicycle commute from my temporary residence, a distance of 1.4 miles. Much more practical! At such a short distance, you really gain nothing from driving. By the time you wait at stop lights and find parking in your car, you’ve made up the difference on the bicycle. The only real complaint I had was that the ride wasn’t long enough. I was just starting to have fun! The commute from my permanent residence will be slightly longer at 2 miles (4 miles round trip). The additional riding time will be welcome. Overall though, today’s experience was very liberating! I knew today would be a learning ride. Since I also ride for fun at lunch, I would need to bring riding clothes for warmer weather in addition to the work clothes that were in my pack. The weather forecast was incorrect, and it ended up being pretty cold at lunch. The warm weather clothes were useless, but luckily I wore cold weather gear for the commute in and was able to use it for the fun ride at lunch. I suppose there is a learning curve on which clothes to bring with you, and which ones to stash at the office. Other things came to mind too; for example, a bicycle lock. I forgot to bring one in case I needed to run an errand. It was just starting to get dark when I rode home. I had a white blinker light on the front, and it worked really good. No cars pulled out in front of me, and they appeared to see me coming. My rear blinker light is still in the storage shed, and I won’t have it until this weekend. I felt a little invisible from the rear and took evasive maneuvers. As we get further into winter, I may adjust my work hours to coincide with the sun for better visibility. I plan to make bicycle commuting a regular topic here. There is much learning to do, and many adventures to be had. I also plan to interview bicycle commuters from around the country, and share their experiences and advice with the challenges they face, whether it be traffic, bicycle storage at work, or riding in extreme conditions. I know what you mean about living too close to work — it makes commuting easy, but robs you of some of the fun. My old office location gave me a 22-mile roundtrip ride. Today, my direct-route commute is 3.5 miles each way, so I usually ride out of the way to stretch it to 6.5 miles each way. When our office moved closer to my house five years ago, many of the daily drivers were grumpy about adding several miles to their morning slog. I got no sympathy from them when I complained that we were moving too close to my house! That is the rub of commuting; too far and you find a million reasons not to do it (like me at 16 miles one way). Too close and you feel like all the “fun” of riding is lost (I would spend more time getting ready than on the bike). But the point is, even in that 2 miles, you are having an impact by taking a car off the road. And I am certain there are hundreds if not thousands of people in just your area alone, who could do the same. Amazing what a change that would make if they all decided to participate. Your a one man revolution Jeff! Keep fighting the good fight. Maybe you should schlep your stuff to work and back in a kid trailer. Then you can take everything in the world you could possibly want or need and ride any bike you like. It would be like a rolling dresser. Date Lunch? Kristy will be shredding the trails with me at noon! No time for lunch! Today I took a less direct route and stopped to take a couple pictures. It was very pretty out with the fog. I love early morning commutes when it is good and foggy, and still dark out. Previous Previous post: Back in Carson!